The unobtrusive, unappreciated thermostat — present on the wall somewhere nearby in most modern buildings — is usually overlooked unless there’s a problem. Like it’s too hot. Or too cold. When planning and spec’ing a heating, ventilating, and air conditioning (HVAC) system, thermostats aren’t the headline act. But in reality, for the HVAC system to do what it’s supposed to do — create a comfortable environment for actual human beings — the thermostat is a key component. If a thermostat is not properly located, then expect a string of complaints about the comfort level of the environment. Where a thermostat is … is important. There are some simple rules that apply to thermostat placement. The first one isn’t about thermodynamics, but office dynamics. If one private office in a cluster is getting the thermostat, it should go in the space where the person with the highest job title in the organization resides. Yet another perk of having the corner office. Everyone will be happier if the boss is comfortable. Back to thermodynamics. Don’t put thermostats near windows, since the immediate area around windows might be cooler or warmer than the rest of the room. Avoid placing them on exterior walls, since the temperature of exterior walls fluctuate more. If a thermostat has to be placed on an exterior wall, make sure the back is well insulated to prevent false readings. What happens in the specific area being considered for thermostat placement has to be thought out. If the location takes direct sunlight at certain times of the day — especially low sun during the winter — that can bring the temperature on the thermostat up by 10 to 15 degrees. But the temperature in the rest of the room won’t change that much (unless the thermostat changes it based on the false reading it’s given). Stay away from supply air grilles. The cold or hot air will have more impact on the thermostat than it will on the rest of the space. Placement near return air grilles is much better, where the best sample of mixed air temperature for the overall space is to be found between 3 to 6 feet off the floor. There are thermostats, then there are thermostats. Once a proper location has been chosen, the next step is choosing what kind of thermostat and — crucially — how much control it gives an occupant over the environmental settings in their area. 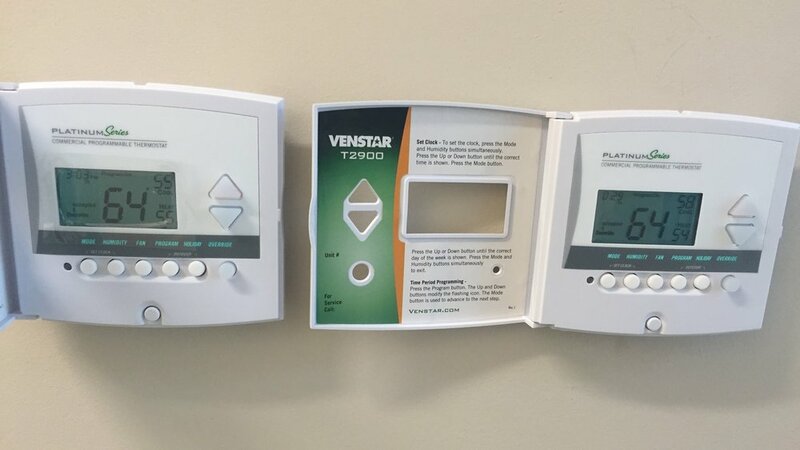 Thermostats can be simple on/off units, allow for only “warmer” or “colder” changes, provide manual adjustment within a range chosen by the building owner (say +/- 2 or 4 degrees), give readouts of actual temperature and other data, or include override buttons to allow operation outside of a predetermined time range (like after normal business hours). Wall-mounted lock boxes for locations like schools or other high-volume public places are also common. Microchips aren’t just for computers. One recent development is thermostats are incorporating more computing technology, much of it focused on energy efficiency. Local codes are beginning to require this technology in new construction and retrofits. For example, California’s Joint Appendix 5 (JA5) went into effect in July of 2014. It requires the use of Occupant Controlled Smart Thermostats (OCST). These units must have internet connectivity capability, so that utility companies can make adjustments during high demand situations if the bulding owner chooses to subscribe to that utility program. They are also capable of scanning a room for occupancy and — when a room is empty — adjusting the temperature to conserve energy. Building inspectors are becoming more aware of these requirements and noncompliance can result in an expensive change order. Plans and bids need to incorporate this new technology in order to meet new building code requirements.